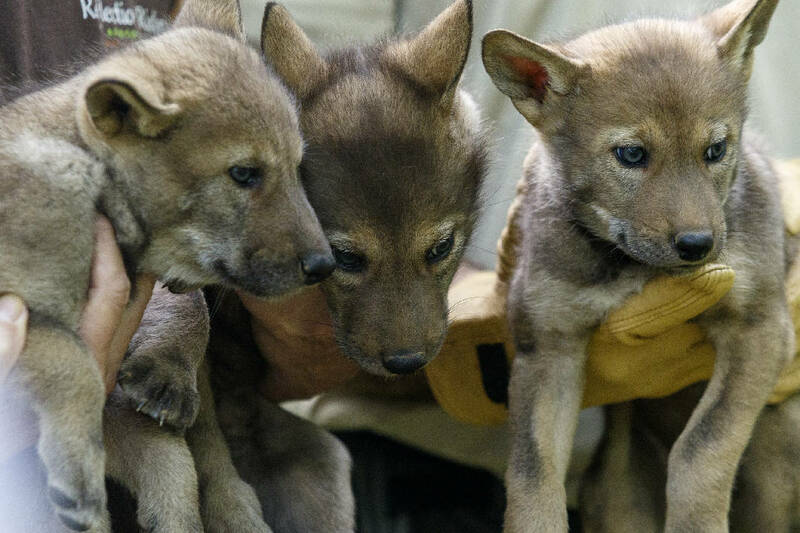 In this May 18, 2016, staff file photo, a trio of red wolf pups are shown to the media at Reflection Riding Arboretum and Nature Center in Chattanooga, Tenn. Reflection Riding Arboretum and Nature Center is home to a pack of red wolves, part of its Red Wolf Project for conservation and research. Red wolves are generally smaller than gray wolves. Website LiveScience.com says red wolves grow to 4.5 to 5.5 feet long and weigh 50 to 80 pounds, compared to the adult gray wolves, which are 4 to 6.5 feet long and 40 to 175 pounds. The Reflection Riding website says red wolves are found only in the United States and are ranked eighth in the world in terms of their potential for extinction and are considered critically endangered. In addition to loss of habitat, the greatest threat to wolves in the wild comes from human activity, primarily gunshot and vehicles. By 1980, red wolves were declared extinct in the wild. The 14 known wild red wolves were captured and relocated to a breeding program in Tacoma, Washington. Today, about 216 live in captive breeding facilities across the country. The national Red Wolf Recovery Program is considered one of the most successful conservation initiatives ever undertaken. In addition to growing the total number of red wolves ten-fold, the program has reintroduced the animals into the wild. Some of those reintroduced adults have successfully brought wild pups into the world. According to newspaper archives, Reflection Riding has been a breeding and exhibit member of the Species Survival Plan since 1996. The plan is an Association of Zoos and Aquariums' cooperative animal management program that focuses mainly on endangered species.